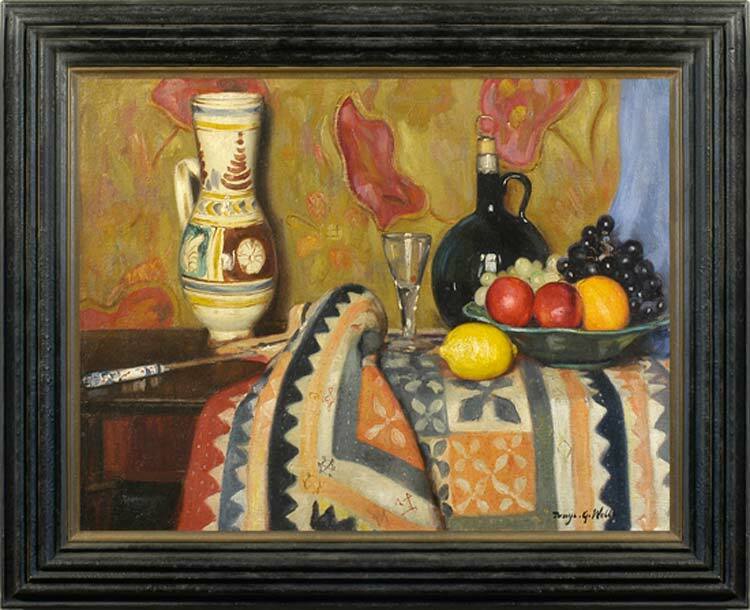 A still life which has something of the feeling of a Bloomsbury painting in its shallow space, dense colour patterning across the canvas, smoky reds and golds, but which is detailed and finished in a style unlike either that of the Bloomsbury artists or that of Wells’s teachers, Tonks and Steer. The abstract pattern and intense colour are filtered through Wells’s formidably acute eye, and undercut by his ability to suggest three-dimensional forms in a realistic space. This is at once a skilfully painted still life and a tapestry-like flat decoration. Denys George Vesey Wells (1881-1973) was born in Bedford, one of the six children of a cabinetmaker and Mayor of Bedford. He trained at the Slade School, London (1897-1903) under Henry Tonks, alongside Philip Wilson Steer, Orpen and Sickert; he continued to study in Montmartre, Paris, for a couple of years, meeting the young Picasso – ‘quite mad’. Soon after his return he was elected a member of the Royal Society of British Artists at the early age of 25 (1906), winning the de Laszlo medal twice in RBA exhibitions; forty-nine years later he was to become Vice President of the Society. During the First World War he served in France, with the Artists’ Rifles, and in the Second World War became an air raid warden; he was awarded the British Empire Medal for gallantry. He produced watercolours during both wars which chart the destruction perpetrated, especially in London, with scenes, for example, of the bomb damage around St Paul’s. He continued to paint in the city after the end of the war, becoming known as ‘the recorder of London’; he also painted elsewhere in Britain, as well as in Venice, Rome, Amsterdam, Spain and Northern France. He regularly exhibited at the Royal Academy, the New English Art Club, Bradford City Art Gallery, Brighton Art Gallery and the Royal Glasgow Institute of Fine Arts. Along with artists such as Orpen, Lavery and Sargent, he was commissioned to paint a miniature picture for Queen Mary’s doll’s house (Windsor Castle). He had a one-man show at the Mall Galleries in 1972, when he was still working at the age of 91; a retrospective, entitled The Last of the Edwardians, was held in the same gallery shortly after his death. He received the Lord Mayor’s Art Award at the Guildhall exhibition of 1969, and the Queen’s Pension for his services to the Arts on the recommendation of the Prime Minister in 1958. A painting by Wells was given to the Prince of Wales at his wedding. See Dreweatts’ catalogue with Wells’s Studio Sale, 19 February 2008. Works in public collections include pictures in Sunderland Museum & Art Gallery; the Municipal Gallery Oldham; the Museum of London and the Houses of Parliament.